SolidWorks Intelligent Feature Technology (SWIFT) lets you spend time creating products that work well, instead of trying to make your software work for you. SWIFT automates time-consuming detail work and techniques, diagnosing and resolving problems related to feature order, mates, sketch relationships, and the application of dimensions. As a result, users of any experience level can be more effective and innovative. Get up to speed fast. SolidWorks CommandManager logically groups similar functions for easy access. And integrated tutorials provide instructive workflow demonstrations along with visual cues. With the Heads-up User Interface, you get a complete, customizable set of visual display and mouse-driven control capabilities that reduce design steps, minimize the need for dialog boxes, and lessen visual clutter. There’s no need to start from scratch when you want to transition a 2D drawing to a 3D model. SolidWorks includes data translation tools along with help documentation for AutoCAD users, so you can smoothly convert DWG files into 3D models. Alternatively, use DWGeditor®—included with SolidWorks software—to edit, manipulate and maintain existing AutoCAD® DWG files in their native format. Speed product development from concept to production with powerful and easy-to-use 3D part modeling tools. Design parts as they will be positioned in the assembly to manage relationships to other parts. Sketch in 2D and then extrude, revolve, blend or sweep the section along a path to create any 3D geometry. Edit by merely clicking and dragging geometry, or by clicking and changing dimensions. Time saving features such as holes, bosses, fillets, chamfers, slots, keyways, o-ring grooves, louvers and ribs are also provided. Drag/drop, pattern, copy and mirror features to eliminate repetitive modeling tasks. Visualize and communicate your designs more clearly than ever. Without rendering, you can quickly create nearly lifelike, fully dynamic representations of your parts, assemblies, and completed products. Improve the aesthetics, ergonomics, and usability of your product designs. Using the Freeform feature, creating new geometry or importing and manipulating new surfaces is easy and intuitive. Create sheet metal parts from scratch using folds, bends, flanges, rips, tabs, mitres, lofted bends, sketched bends, hems and more. Alternatively, create a solid shape as starting point then use advanced capabilities such as ‘convert solid-to-sheetmetal’ functionality to develop a manufacturable sheet metal part. Sketch a layout for your frame and select a weldment profile, then SolidWorks will automatically generate a weldment design in 3D. Modify, validate, reinforce your design then enhance it with standard parts that you can drag & drop from the Design Library and/or 3D ContentCentral. Then, generate precise manufacturing drawings with cut lengths for all segments. In SolidWorks, you can import any of the major CAD formats including IGES, STEP, Parasolid and ACIS to begin your mold designs. Complete your mold design using specialized mold design features such as parting lines and surfaces, and core/cavity splitting as well as specialized plastic part design features such as shrinkage, draft, ribs, fastening features and lip and groove features. SolidWorks gives you the tools to “get it right” on screen when you create assemblies—saving the time and cost of physical prototypes and remanufacturing. Mate components by picking individual surfaces, edges, curves, and vertices. Create mechanical relationships between components. Conduct interference, collision, and hole alignment checks. Link motion of pulleys and sprockets. Automatically assemble fasteners and accompanying hardware. Automate assembly of commonly used components, appropriate hardware, and required features. Use MateXpert to fix conflicts such as over-constraining a component. Simply by clicking and dragging components, you can check an assembly for proper motion and collisions. In addition, you can simulate physical motion involving assembly mates, contact, springs, and gravity, as well as create, edit and save video animations. Use “Lightweight” mode to reduce time spent opening and working on large assemblies. Speedpak technology enables simplified versions of assemblies to be created that speeds assembly operations and drawing creation. Use Quick View to select and open just the components you need to work on. Analyze and improve your assembly’s performance using the AssemblyXpert. Develop production-ready engineering drawings that automatically reference the 3D part so that drawing views and bills of materials update each time that you modify the part or assembly design. In addition, you can use DWGeditor to maintain and update all your existing DWG drawing files. Easily import and use existing data, as well as data from external sources. SolidWorks includes translators that support DWG, DXF™, Pro/ENGINEER®, IPT (Autodesk Inventor®), Mechanical Desktop®, Unigraphics®, PAR (Solid Edge™), CADKEY®, IGES, STEP, Parasolid, SAT (ACIS), VDA-FS, VRML, STL, TIFF, JPG, Adobe® Illustrator®, Rhino®, IDF, and HSF (Hoops) formats. Leverage your successful designs to create compelling proposals for new ones. Quickly search for pre-existing components in your own custom design library, then simply drag and drop them into your new designs. Significant time savings result when you use SolidWorks to automatically generate a complete Bill of Materials (BOM) from your design. Your BOM is associative: When you change your design, the BOM updates automatically, and vice versa. Plus, you can export the BOM data to Excel, ERP, and other applications. SolidWorks Simulation tools help both new users and experts to ensure your design is durable, safe, and manufacturable. In addition, you can use SolidWorks FloXpress to optimize your designs for water and air flow effects. Save time with SolidWorks Smart Component technology to automate the selection and insertion of standard components and DriveWorksXpress to automate repetitive design tasks and provide configurability of your design, allowing the quick creation of several variants from a single design. With SolidWorks, you’ll have numerous capabilities for accurately communicating design ideas and data to collaborators, upstream and downstream partners, and customers. Formats include PDF, TIF, JPEG, DWG, DXF, IGES, STEP, STL, AVI, Parasolid, Pro/ENGINEER, eDrawings as well as many others. Collaborate more effectively by creating eDrawings files that can be reviewed and marked-up. Let an unlimited number of recipients mark-up and provide feedback on product designs. When people you collaborate with use other CAD systems, FeatureWorks helps you share imported data by allowing conversion directly to a SolidWorks 3D model. You can elect to rebuild the entire imported model with SolidWorks features, or select individual features to convert. 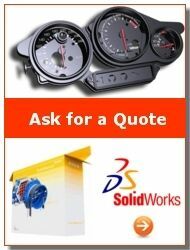 With SolidWorks Toolbox, you have instant access to thousands of pre-built SolidWorks models of standard hardware such as bolts and screws, bearings, o-rings, gears, etc. Just drag and drop them into your design, or use the SmartFasteners capability to automatically assemble and size fasteners. Use PhotoWorks and PhotoView 360 to leverage your SolidWorks 3D models for presentations, proposals, and virtual and material studies—before creating any parts. Save time and eliminate the high costs of prototyping and photography. Raise your quality level with SolidWorks Design Checker. With thorough, automated checks and autocorrect capability, you can ensure full compliance with your company standards before you release your designs for manufacture. SolidWorks Utilities enables the designer to do many things including compare parts or drawings to find differences between two similar designs or similar drawings. FeatureWorks streamlines use of data from different CAD systems to work together. Automate and accelerate the process of routing tubes, pipes, electrical cables, cable harnesses, and electrical conduits with SolidWorks Routing. Use CircuitWorks, a bi-directional ECAD translator, to ensure the fit and function of printed circuit boards (PCBs) into electrical and mechanical products. Protect your product design data with secure, managed access to authorized individuals, over a network or via the web. In addition to internal users, you can also permit access to partners, customers and your supply chain. Help your design team avoid overwriting files and help purchasing and manufacturing order and produce the correct parts, every time. Quickly and easily find SolidWorks files by searching on metadata (Custom Properties). TolAnalyst allows tolerance stack-up analysis directly inside SolidWorks, and analyzes designs based on the order and manner in which parts are assembled, as well as DimXpert-applied dimensions and tolerances. Determine if your design meets fit and function requirements without tedious and error-prone hand calculations. Study the interactions of assembly components onscreen, before incurring the costs of physical prototypes. Accurately simulate static or dynamic loads to evaluate your design’s performance under stress, strain, and displacement. Apply a wide variety of physics-based models to simulate real-world operating conditions for your design. Check for colliding parts. Output numerical and graphic data of the results, as well as animations of your tests. Ensure your welded structures perform at peak operating conditions. Apply pressure, forces, and bearing loads. Then use powerful visualization tools like sections plots, iso-clipping, and animation to review the response of either the full assembly or only certain parts. 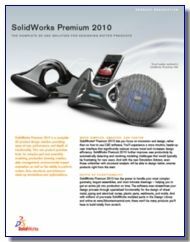 View SolidWorks Demo FREE Online Now !